Retired auction house exec back in action after surgery for spine tumors. John enjoys an active lifestyle. He travels often and stays in shape by following an exercise regimen developed by his personal trainer, who is also a physical therapist. John’s workout program includes core strengthening exercises and Pilates. He began having mild back pain in 2008. Even with the pain, John continued to stay active by working out with his personal trainer who selected special exercises that can actually help relieve back pain symptoms. He also tried giving his back some rest. Unfortunately, John’s back pain did not go away, in fact, he started having shooting pain into his legs. After several weeks of pain symptoms, John went to his doctor to find some pain relief. John’s doctor examined him and then referred him to Dr. John Regan, a fellowship-trained orthopedic surgeon in Beverly Hills, who specializes in the spine. 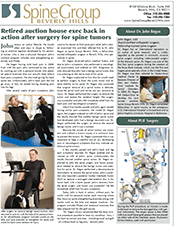 Click here to download a PDF of John's successful recovery from spine surgery performed by Dr. John Regan to remove benign spine tumors.